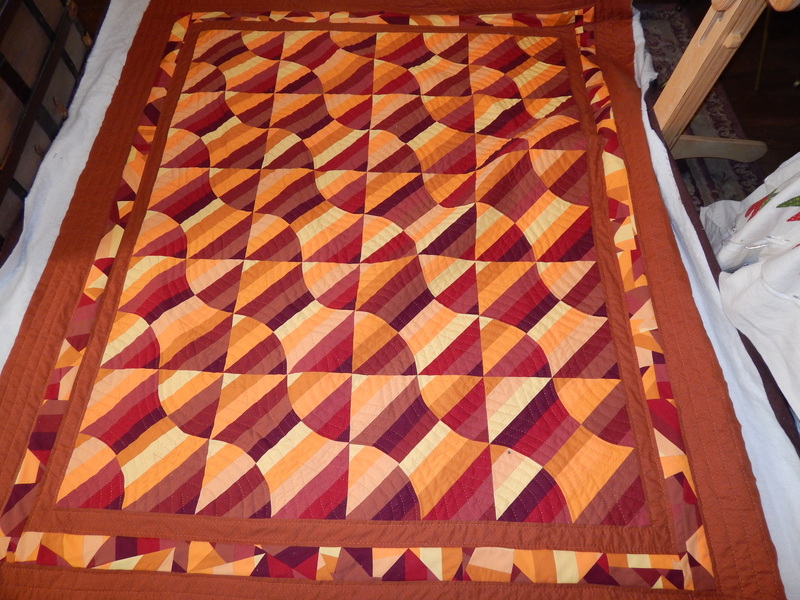 After the top was finished I set it aside to work on other quilts and I didn’t start the quilting until March 16. 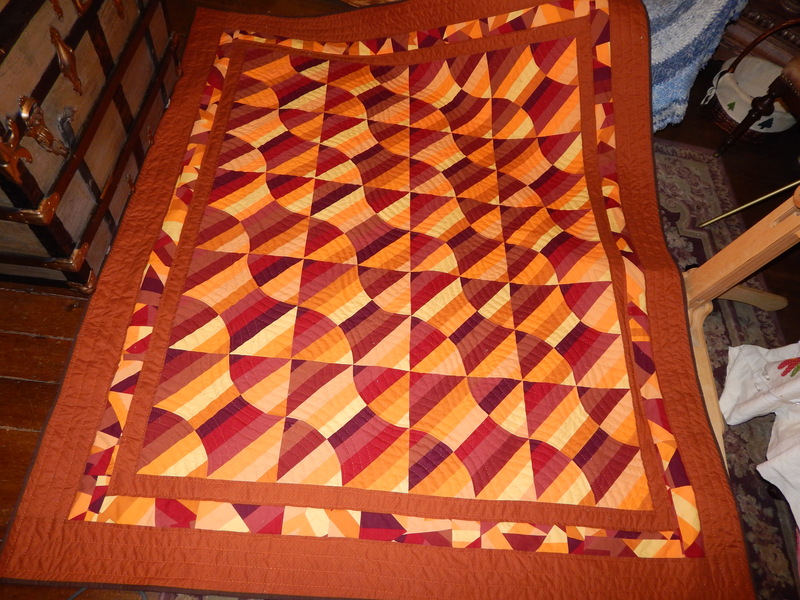 Here it is with the quilting finished. 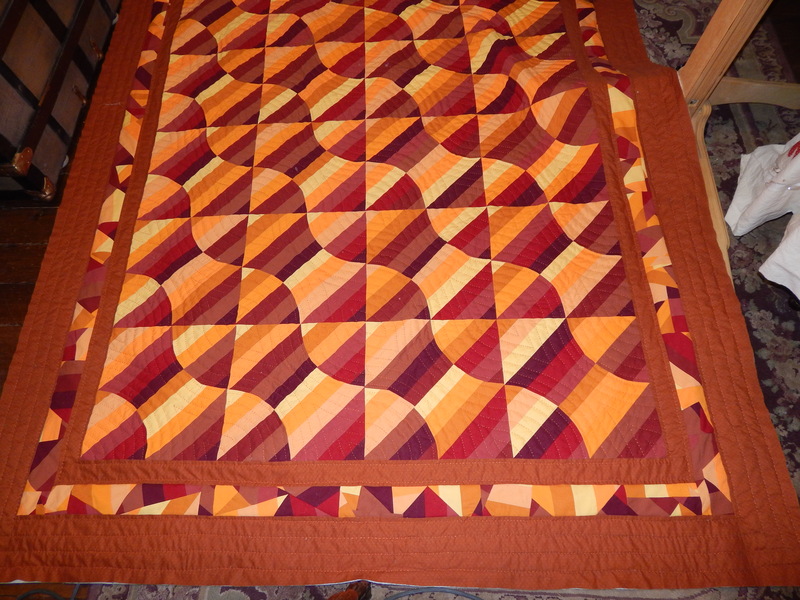 After the quilting is finished I trim off the extra batting and backing. And as always I wash the finished quilt and dry it. 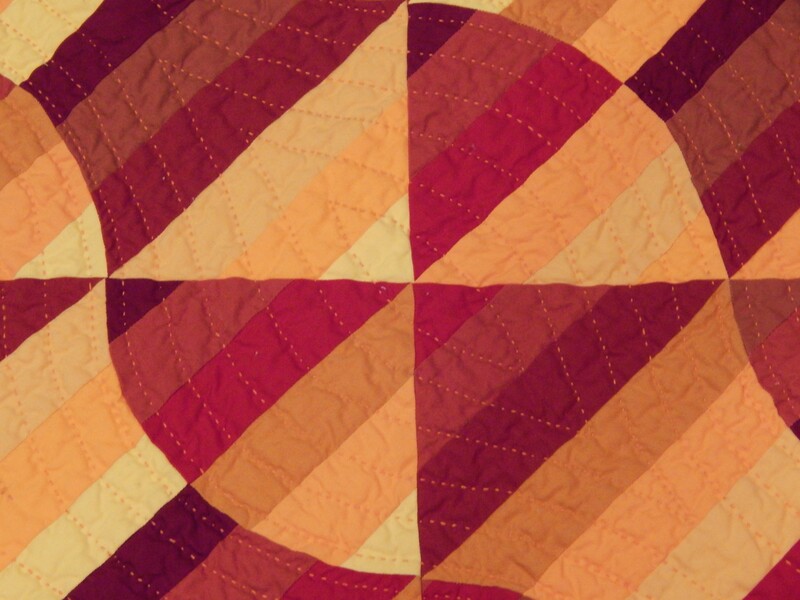 This entry was posted in Quilts and tagged hand quilting, quiltimg, Quilts, striped curves. Aw, look at Teddy’s ears, back and down – happy doggy! Nice finish, have a great day! It looks wonderful! I’ve really enjoyed watching your progress on this quilt. It’s been such an interesting journey. Amazing how quick you work! Very beautiful as always. Nice greetings for you and Teddy from the Netherlands! 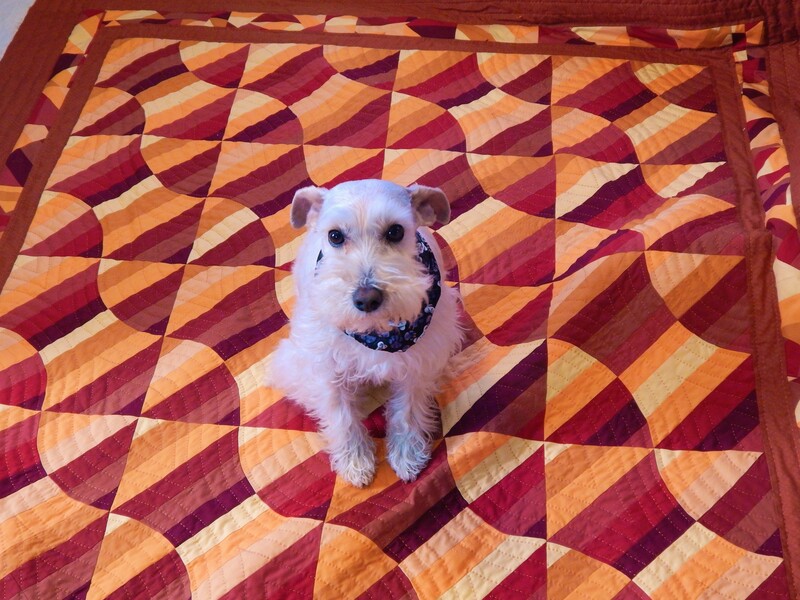 I am very impressed with the speed of your quilting. It takes me almost this long and I machine quilt!!!!! Hi, Tim! I just discovered your work, no talent, today. What a treat! I am a quilter, but nothing even close to what you do. I really enjoy looking at your projects.I wish you lived closer. 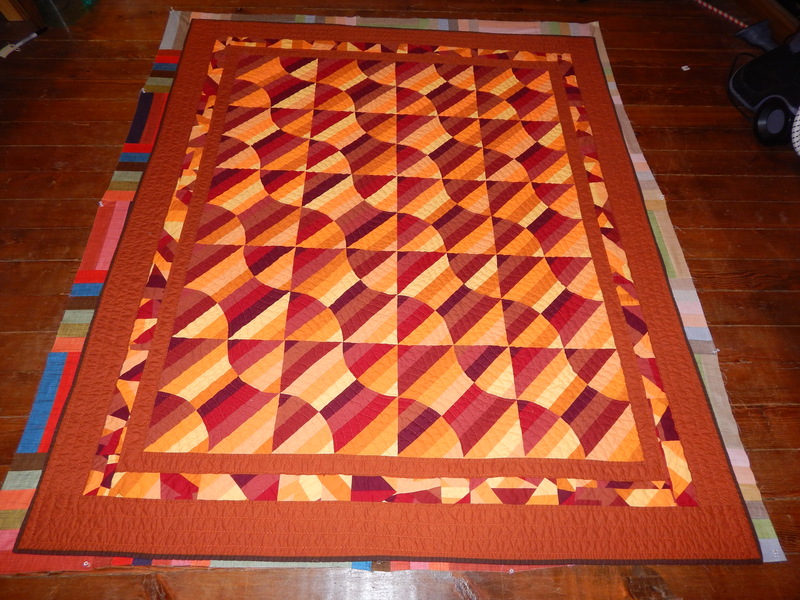 You would be a wonderful program for our quilt guild. But, I’m in Minnesota. However, I am definitely planning to pass your website address on to other quilters. Thanks again for sharing your talent. This is a beautiful quilt. Love the fabrics, colors, and design. Lovely work!! Your work was a real pleasure to see, as I have a migraine. Took my mine off that nagging pain for a bit. So thank you!! This is my favorite of all you have created so far. So enjoyable to look at. It’d beautiful Tim. I especially like your border the way you did the solid then the print and the wide solid out side border. And, I like the simple quilting on the borders. It’s just a marvelous piece of work. You did well. The quilt of course is stunning! But the more I actually look at this quilt the more it seems unique. You have done a great FAST job on this creation. Well Done!